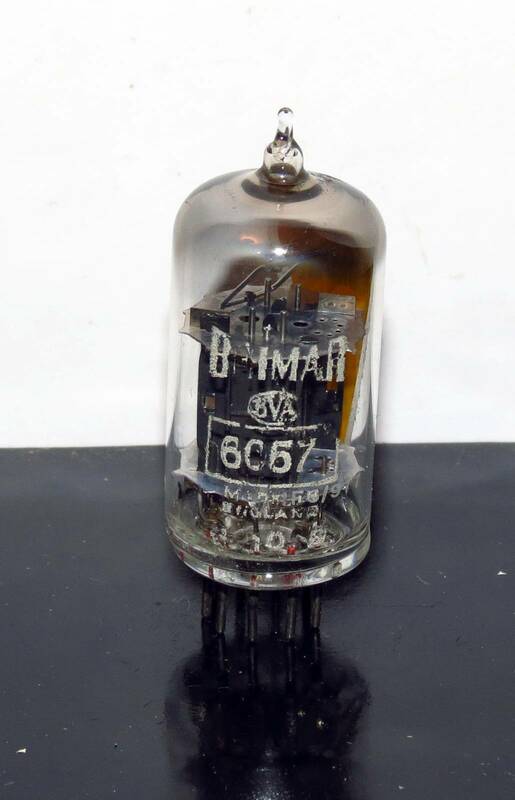 This entry was posted in Vacuum Tubes and tagged 12ax7/ECC83, Briamr by tubemaze. Bookmark the permalink. Superb tube – so much character and complexity! Definitely this is one of the handful tubes that I would count as the best of the best of 12ax7 family. This is the warmest Brimar that I experienced so far, but doesn’t loose details in the process of “warming up”. Very complex sound with fantastic separation of instruments and layering of sounds, where not even a single not gets garbled. Internal structure of the tube also deserves some attention – if you look close enough at the picture, you will see that the plate is not a complete -- shape, but just a part of it -. I don’t know if that affects sound somehow – very unlikely, but cool looking plate. The tubes that I have has the famous Yellow T (“Trustworthy”) sticker, which indicates tube of a special quality. Considering that 6057 already indicates special quality 12ax7 addition of T makes it super special 🙂 HIGHLY RECOMMENDED.